Walt Disney's main reason for making films was to provide quality entertainment for the whole family. He had great success in almost every genre except for comedy, where his successes tended to more childish in nature. With Bon Voyage!, he set about making a film that was as much for adult viewers as it was for children. The film is based on a book of the same title, written by husband and wife Joseph and Marijane Hayes. Writer/producer Bill Walsh adapted the screenplay, having previously done most of the Disney comedies including The Shaggy Dog and The Absent-Minded Professor. Fred MacMurray had become Walt's go-to actor for family comedies and Tommy Kirk and Kevin Corcoran, who previously played his sons in The Shaggy Dog, were cast as two of his three children. Debora Walley plays the daughter in her first of two Disney films. And Jane Wyman returns to Disney after starring in Pollyanna a few years earlier, although this would be her last film for the studio. It is directed by James Neilson, fresh off the set of directing Moon Pilot. Much of the filming took place on location in Paris, France. The title song was written by the Sherman Brothers. The film begins with an entertaining travel montage as the title song plays. The Willard family from Indiana arrive in New York City to depart on a cruise. The minute they arrive, problems begin including the daughter Amy meeting a boy named Nick that Harry, the father, doesn't like, Elliott mopes about his girl he left at home, the youngest song Skipper gets into mischief and Harry's in-laws throw an uncomfortable going away party for them. Things get serious with Amy and Nick, Elliott forgets his girl back home and becomes a womanizer and Harry realizes that he is getting too old to keep up with Skipper. Harry and Katie assume the problems with their children will stop when they get to Paris, but Amy runs off with Nick who was supposed to go to England, but followed them instead. Katie goes to visit a friend who now lives in Paris and Eliott is out dating, leaving Harry with Skipper, who convinces him to take a tour of the city sewers where Harry gets lost and embarrasses himself. When Nick joins a family outing, he and Amy get in a fight because Nick doesn't believe in marriage. At a party Harry has too much too drunk and passes out. Meanwhile, Katie was being hit on by a persistent man who causes a fight between the happy couple. They relocate to the French Riviera for the remainder of their trip where Amy becomes a big hit with boys on the beach. Nick shows up and gets jealous. Elliott gets in trouble with the mother of a French girl who claims he took her daughter's "virtue" and demands that he pay money or she will call the police, thinking they are rich Americans. Harry says the right thing to do would be for the two to get married which scares them away. On their last night in France, Katie's pursuer returns so Harry punches him and gets arrested. Nick comes to his rescue and having seen a successful marriage, changes his mind about it. The film ends with the whole family dancing and having a good time as fireworks shoot into the night sky. Bon Voyage! was released on May 17th, 1962. Critics hated it, citing its long run time (132 minutes) as its biggest fault. They also complained that it kept bouncing between a film for kids and a film for adults without successfully doing either. Audiences ignored the critics and the film was a success, grossing $5 million at the box office. It was nominated for two Academy Awards for best costume design and best sound. Much of the filming took place on location in France. The scenes on board the cruise were filmed on a real ship, the S.S. United States, which is currently in Philadelphia being preserved. It made its TV debut in 1970 and was first released on home video in 1987. I first saw Bon Voyage! when it made its DVD debut in 2004 and I instantly liked it. All of the actors are delightful in their roles, although Kevin Corcoran is too old for some of the lines his character says. The film is longer than it ought to be and the editing department certainly could have been a bit more severe with some scenes, but more often than not it is very entertaining and funny. I will say that I was surprised at some of the content for a film that bares the name Walt Disney. The film gently touches some issues that today would warrant a PG-13 rating if taken any further, such as horny teenagers, prostitution and talk of virginity. The good news is with its long run time, any kids will probably be asleep before those scenes arrive and those that aren't won't really understand the issues since Disney handles them in a very subtle manner. 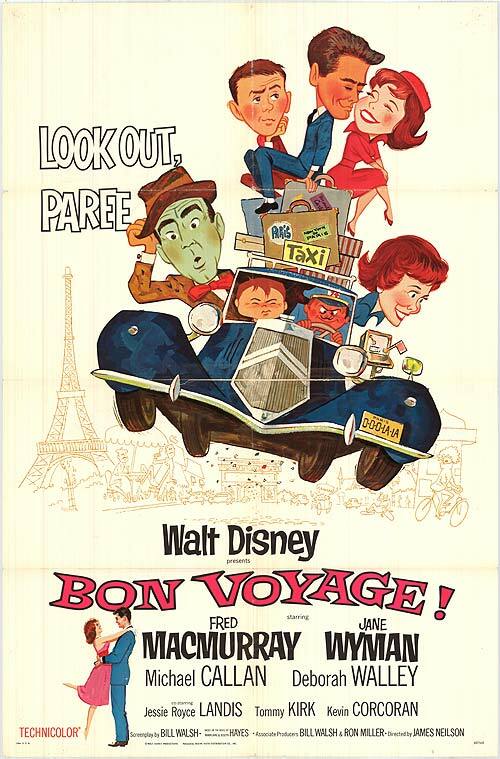 While it may not be the typical Disney family comedy, Bon Voyage! is a great 60's family comedy. Bon Voyage! is currently available on DVD. The film is presented in pan & scan fullscreen, although the original theatrical aspect ratio was 1.75:1 widescreen. It doesn't appear that a restoration was done, since most scenes seem discolored and some have excess grain. This is most likely the original VHS master quickly put on DVD. There are no bonus features. The film is available on iTunes where it is presented in widescreen and in HD. Looking forward to see more bon voyage posts like this one.